There are more than 2,200 species of fleas recognized worldwide, but actually, only a handful of those affect dogs in North America. The cat flea most often infests dogs and causes more than itching. Fleas can cause allergies and anemia and transmit tapeworms; they are also the agent that causes cat scratch disease. To pick the best anti-flea weapons, you must first understand the enemy. The adult flea you find crawling through your puppy’s fur represents only the tip of the iceberg. Puppies with fleas become quite itchy and they can drive your pet nuts. Fleas seem to prefer the back end of dogs, so your pet may chew its flanks and above the tail region. Parting the fur also often reveals "flea dirt" which looks like tiny black specks caught in fur. This digested blood is flea feces, and it turns red when placed on a damp cloth. With pets that are allergic, a single flea bite can cause all over itching. These pups become sensitive and react to flea saliva. Products that don't just kill but also repel fleas work best for allergic pups. Fleas, members of the order Siphonaptera, are flightless external parasites of both birds and mammals. About a tenth of an inch long, they have flat bodies and strong claws that make it easy to cling to a host's skin, hair, fur, or feathers. Fleas have mouthparts that allow them to pierce skin and drink blood. When on the move, fleas can hop long distances. Adult fleas represent only five percent of the total flea population; the remaining 95 percent, composed of flea eggs, larvae and pupae, lurk in the environment. Flea bites cause itching; in allergic hosts they can also cause swelling and hair loss. Fleas can also carry a wide range of diseases, some of which are deadly. Flea-borne diseases have ravaged human communities and can have a devastating impact on pets. Fleas can lay 20 to 40 eggs per day, and 10 female fleas can create almost a quarter of a million different life stages in a month. Newly emerged flea larvae can survive two weeks without a blood meal, and pre-emerged fleas (pupae/cocoon stage) can survive six months without feeding. Treating fleas involves removing and killing existing adult and juvenile fleas. Flea products may address the egg, larvae and adult stages, but no insecticide can kill the cocoon stage. You must wait until it hatches to kill it. It takes 14 to 21 days for the lifecycle to be complete. It's best to start with natural, non-toxic interventions before proceeding to use harsh chemicals; in some cases you'll be able to eradicate fleas without any potentially harmful side effects. 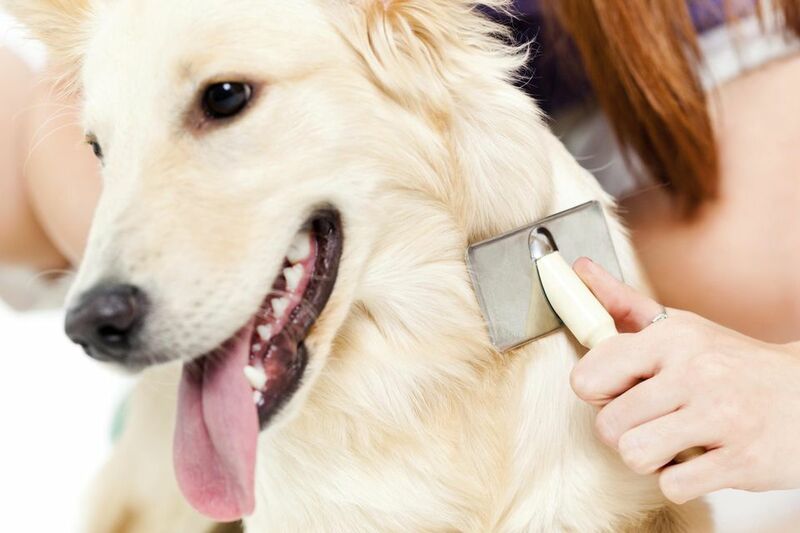 The safest and most “natural” flea control technique involves using a flea comb. Frequent vacuuming of the carpet removes up to 90 percent of flea eggs and 50 percent of larvae. Don’t neglect washing pet beds, carriers, blankets and throw rugs as well as any sofa cushions or other favorite pet resting places. Bathing puppies can get rid of existing fleas but won't necessarily keep them off. Be cautious of so-called "natural" flea products as they may still be dangerous for youngsters. Spray products do a better job and have some residual effect. Products that contain insect growth regulators (IGRs) are the best choice for precise control because they prevent immature fleas from maturing into biting adults. They typically last a long time with a single application, some as long as seven months. IGRs attack insects but not the pet and are one of the safest of the flea ingredients around. For instance, methoprene fools flea larva into thinking it’s a larva forever, so it never turns into a biting adult flea. Another early IGR called lufenuron (once-monthly pills for your pet) inhibits the development of the exoskeleton of the flea and sterilizes the bug so it can’t reproduce. Pyriproxyfen (Nylar) works like methoprene but with an increased potency that also kills flea eggs and larva. A better understanding of flea biology also helped researchers to develop active ingredients that attack the flea nervous system. These include fipronil (Frontline), imidacloprid (Advantage), nitenpyram (Capstar), and selectamin (Revolution) applied as spot-on treatments once a month. All four of these active ingredients take 24 to 48 hours to be effective, and each offers slightly different benefits. Imidacloprid kills adult fleas and has a month-long effect. Fipronil also kills adult fleas for a month as well as ticks. Selamectin protects for a month against a host of pests including fleas, ear mites, heartworms and certain types of ticks. Nitenpyram, taken as a pill, kills adult fleas that feed on a treated pet within 20 minutes but is only effective for 24 hours and isn’t helpful for flea-allergic animals. Some of the most effective flea and tick products today combine an adulticide to kill adult fleas with an IGR to control the immature bug population. You can find a fipronil and methoprene combination product that kills fleas and ticks (Frontline Plus), as well as etofenprox partnered with Nylar or methoprene in various over-the-counter spot-on products that help control fleas and ticks. Products that contain imidacloprid with permethrin (K-9 Advantix, for dogs only) or spinosad (Comfortis for dogs) also are available. Fleas hate direct sunlight and prefer outdoor shaded areas with sand, leaves, or other debris, so the lifestyle of your puppy determines their exposure. Indoor couch potato pups won’t need the same protection as hunting dogs that roam the field. But even pups that visit the yard on a leash have enough exposure to warrant flea protection. For outdoor habitats, cut the grass short to allow sunlight to shoo away the bugs. Keeping your pets from problem areas and treating the bug habitats helps reduce the pest population. Nematodes—worms that eat immature fleas—are available from lawn and garden supply outlets. Age and health also influence the type of product you should choose. Look at the label to make sure the flea or tick protection says it’s safe for your individual pets. Some are not safe for puppies. While the extreme cold can kill parasites and they remain active only during warm months, it's hard to predict and anticipate a weather change that brings out the bugs. Thus, the Companion Animal Parasite Council (CAPC) recommends year-round protection against fleas and ticks. Consult with your veterinarian about how to best to protect your puppy in the bug wars. Some products only are available by prescription. If you choose an over-the-counter product, look at the label and follow product instructions to ensure the health and safety of your pets. How Can You Control Fleas on Your Pet and in Your House?